Newly constructed shanty, with a partially papered roof and brand new washtub, wash basin and scrub bucket outside. 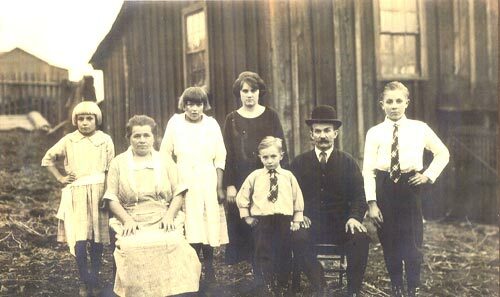 An Eastern European family in front of a board-and-batten style Heilwood shanty. 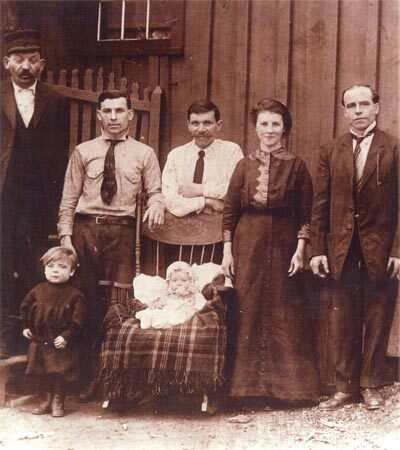 Another Eastern European family in front of their Heilwood shanty. 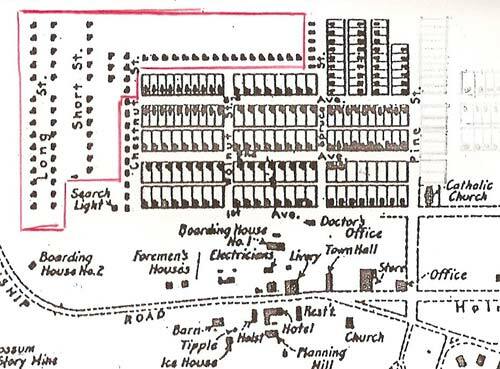 A map showing the location of the shanties (outlined in red) in relation to the rest of the town. 1916 Heilwood School record indicating that the student was living in “Shanty Row”. 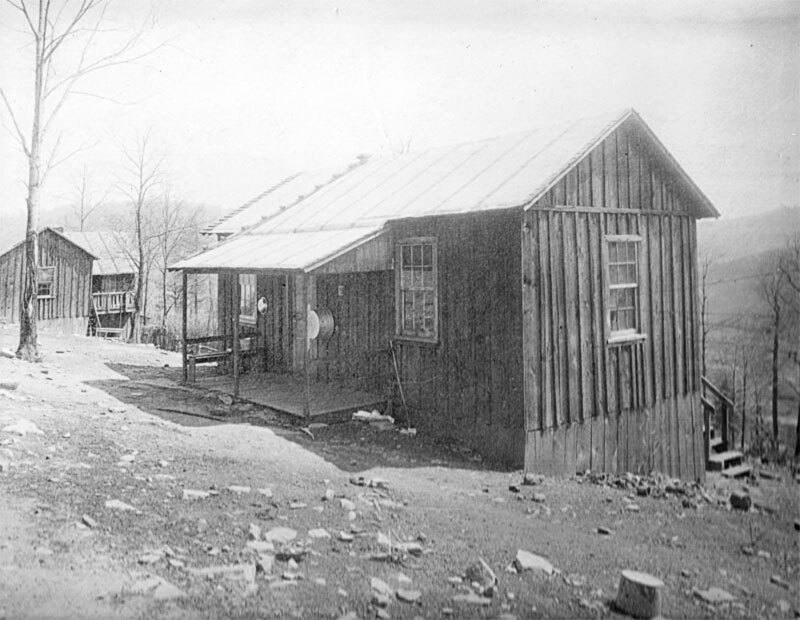 There are still many examples in Heilwood of the four-to-eight room houses built for the employees of the coal company – even a large number of the “supervisory” homes are still standing. However, nowhere in Heilwood today can you find the homes that were built for the many Eastern Europeans who would work in the mines. The lack of an existing example of these homes is quite simple. Upon construction, these homes were built as cheaply as possible, with the poorest quality materials and construction techniques. Any reduction in the workforce and subsequent need for housing would find the coal company tearing down these homes and moving the people to other existing homes vacated by departed workers. These homes were called “shanties”. Located on the perimeter of town, below both Chestnut Street (Doctor’s Row) and Third Avenue (Third Street) (see map), these houses probably represented the coal company’s regard for the people who would live in them. According to local tax records, there were 71 three-room shanties in Heilwood by 1911. They would remain viable housing units until 1923-24, at which time some of them were dismantled. This dismantling continued into the 1930s and by the early 1940s, only one three-room shanty appeared in the local tax records. By design, the shanties were a simple ‘L’ shaped structure of posts and beams to which exterior boards and batten strips were attached. Relatively inexpensive to construct ($305), these structures provided the very basic requirements: four walls and a roof! There was only one thickness of board used on the walls – no plaster or finished walls on the inside. Any insulating would be done by the tenant at their own cost. The floors were also simply a single layer of boards. Since the majority of these homes were located on the hillside surrounding the town, one end had to be elevated. This open area under the house was not closed-in unless the tenant decided to create a “barn” area for their livestock – cows, ducks, or chickens. Front and rear porches were also available, but many people enclosed them to provide additional living space. There was no central heating system. A kitchen coal/wood stove would provide the heat for the house. Quite possibly, an additional stove would be placed somewhere in the house for more heat. Also, there was no indoor running water – instead, a communal outdoor pump serviced multiple families. Privies were also shared with the neighbors. Oil lamps and possibly candles would illuminate the interior. The exact size of the shanties is unknown, but existing records show that they were built with three rooms. Quite possibly, by enclosing the porches, the tenant could add additional rooms to house boarders, which might supplement his meager wages in the mines! The bottom photo on this page shows a 1916 Heilwood School record indicating that the student, rather than living in Heilwood itself, was living in “Shanty Row”.